No Skiing for You This Season? Huck It with This Fun Game Then! Winter is slowly coming to an end, and even though the avid skiers still have a few weeks of the good snowy weather ahead, not all of them are able to venture out to a fancy ski resort. If you are one of them, missing out on the fun this season, you might as well quench some of that insatiable thirst by playing skiing games on your tablet. Enter Huck It. Based on a real, existing location in Salt Lake City, a luxury alpine ski resort that once hosted the Winter Olympics, this 3D freeride ski game is exactly what you have been looking for. It is beautiful, realistic, customizable and hard – are you up for a challenge? The gameplay in Huck It is quite challenging, but ultimately fun when you get the hang of it. It is a third-person racer, and you observe the slopes from behind your skier’s back, but the viewpoint is quite good. The goal is to ski down a natural slope, jump in time to perform a stunt or two and land in a specific area. Touch the skier to start skiing off a moderately curvy slope in Training, or go ahead to the Freeride or Racing modes – there are plenty of challenges. The controls are both intuitive and hard. The point is the game is physics-based, so unless you understand when it is time to duck, or bend your knees, or on the contrary, straighten your back, you will have a hard time sorting out how the on-screen joystick works. Then, there is a blue fingerprint button, which stands for jumping. This alone would have been enough a challenge to sort out, but the developers went a step further and added tilt controls to turn left and right, which makes it even more difficult to control the character. This might be a blessing, or a turn-off, depending on how you like your games – with or without tilt controls, because there is no option to play without them. Mastering that hybrid control system is probably the primary challenge you will have to overcome if you like the game, and there are things to like about it. The fashionistas will be able to customize the skiing suits and gear to equip their characters with the neatest details that will ultimately improve their performance. Another perk is the variety of challenges and slopes, and the decent 3D rendering makes sunshine in the pines quite realistic. Fanatic skiers will appreciate a good deal of in-air ski tricks and stunts they will be able to perform – ski off killer cliffs, float, experience some free fall, spin, get inverted, nail an iron cross and more. The more powerful combos you perform, the higher your score, the more customization you will be able to perform. Ski through the pines, break a neck falling off a cliff, or embrace the freshness of the alpine snow-covered greenery with your suddenly toothless mouth as you bump into a series of trees – Huck It has it all. The game offers a great deal of content for free, and you can evaluate all its virtues to some extent without paying a cent. In terms of visual presentation, Huck It is pretty good and realistic. 3D rendition of snow, sunlight and trees is wonderful. I did encounter a blunder when I hit a group of trees, though. There were some four or five pines, and as I lay there with twisted legs, the camera was sort of floating above me, delivering a cinematic view of my epic fail. And there it was – the pines were flat, like the mock-ups. That little surprise did not spoil the fun of viciously murdering my characters because I haven’t mastered the controls, yet. That said, the “voluptuous curves” look realistic and detailed, making you want to hit the slopes. A bonus 2D side-scroller game with snowboarding Abe Lincoln – because why not? 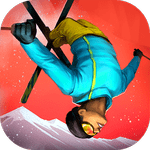 Huck It: Freeride Skiing 3D is delightfully challenging, visually competent and ultimately cool. That said, it could use a little bit adjustment to the difficulty for the easiest difficulty mode. In other words, despite its undeniable awesomeness, the game may be inaccessible to the uninitiated players. Moreover, even avid snowboarders report having trouble landing. The game is physics-based, and the complex control system that combines touch and tilt controls allows users perform incredibly complex stunts in terms of physics and mechanics. However, the has a steep learning curve, which might stand in the way to real fun for many. And real fun there is – amazingly realistic Utah slopes, multiple customizable characters with suits and performance-enhancing gear, good music, extreme weather conditions, several difficulty levels for the daring – all that and developers’ real passion for skiing make a great game that is a bit too difficult (for the beginners) to be the best it can be. On the contrary, snowboarding and skiing adopters might find the sweetest delight in hucking it. All things considered, it is a must-try game this winter season. Huck It: Freeride Skiing 3D is delightfully challenging, visually competent and ultimately cool. That said, it could use a little bit adjustment to the difficulty for the easiest difficulty mode.